A woman crashed her car early Sunday morning in Lincoln Park, then took off on foot, leaving two passengers behind in her crumpled vehicle. One of the passengers, a 79-year-old man, was left with a traumatic brain injury. 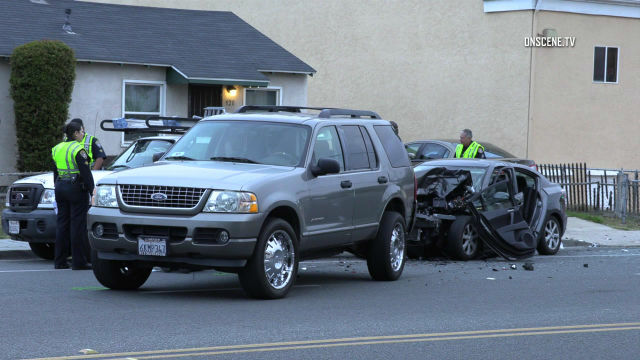 The crash was reported at 4:51 a.m. near the intersection of 47th and Market streets, according to San Diego Police Officer Sarah Foster. The 79-year-old man, who was asleep in the back seat, received a large laceration to his head, Foster said. The other passenger, a 39-year-old man, complained of pain to his chest but suffered no other injuries. A witness at the scene saw the driver, identified only as a woman in her 50s, fleeing the area on foot, Foster said. It’s unknown if drugs or alcohol were factors in the crash.